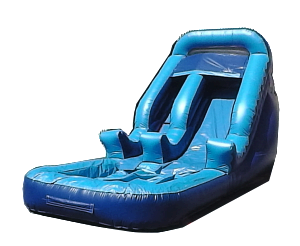 The Blue Surf Slide is a front loading slide with a low profile pool. It has an inflatable landing at the beginning of the pool to insure a soft landing. Recommended for kids up to 12 years of age. This slide is great fun for those hot summer days! Comes with water attachment. Customer must supply water hose to reach unit.